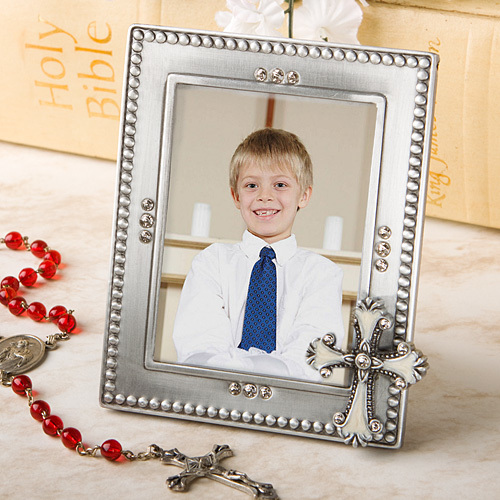 These lovely frames, featuring a cross detailed with ivory inlay and rhinestones, are sure to be a treasured keepsake from your celebration. They are popular Christian wedding favors, as well as Baptism, Christening, Communion and Confirmation favors. They arrive gift boxed and include a blank place card so that you could also use them as place card holders as well as your party favor. Our frames feature a pewter-finish on a metal frame. Its beaded borders also feature shimmering rhinestones to compliment your photo. The frame measures 4 1/2" x 3 1/2". At the frame’s center is a 2 1/2" x 3 1/4" glass window with a hinged slot for easy insertion of a photo or place card; the back of the frame features a black felt easel stand back. Each cross frame comes with a cross decorated “For You” message showing through the window, in a white box with a blank vertical place card included. Please allow up to 5 business days to fulfill your order; then add ship time from NY.